As this article goes to press at 10:30 am, June 13th, 2018, the exchange rate stands at 53.10 Philippine pesos to 1 US dollar. The Manila Times reports that Singapore-based bank DBS is predicting a fall to P54 versus the US dollar by the end of this year, 2018. Earlier forecasts posted in this website had predicted an even further decline of P56 to 1 USD by year’s end. DBS claims that the Philippines’ weakening external position and higher interest rates will continue to put pressure on the Philippine peso. “The currency has depreciated 5.8 percent year-to-date, more than the full-year depreciation of 5.4 percent and 4.7 percent seen in 2016 and 2015, respectively, to become the weakest currency in Asia ex Japan,” DBS stated. It noted that the peso had fallen to a 12-year low against the dollar On Monday, June 11, 2018, the Philippine peso closed down at P52.95:$1, the lowest since a P52.98 finish on July 3, 2006. “The latest weakness was triggered by the trade deficit which widened to a cumulative $12.2 billion in the first four months, 1.6 times wider than the same period a year ago,” it added. The Philippines had finished 2017 posting its largest ever annual trade deficit, putting pressure on the already weak peso. BSP is the central bank of the Philippines. Earlier, Espenilla was unperturbed by the peso’s decline, saying it was natural for the currency to move up and down. “That is market… It goes up and down. What can I say,” Espenilla said in reply to a query. He added that he was not worried on the current level of the peso. 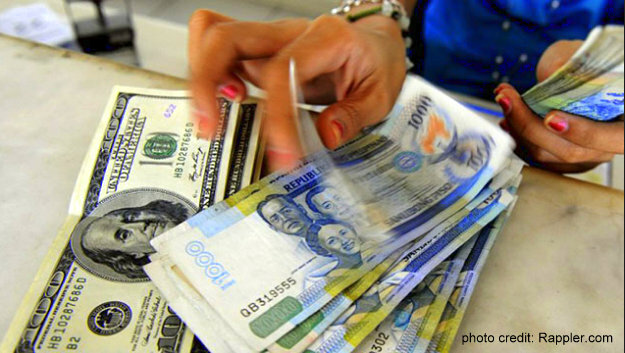 Back in April 2018, the philstar.com published an article wherein the country’s policymakers stated they expect the Philippine peso to trade at a range of P50 to P53 against the dollar this year until 2022 amid the normalization path taken by the US Federal Reserve. Members of the inter-agency Development Budget Coordination Committee said they changed their peso-dollar rate forecast from the previous P49-P52 given the “fiscal stimulus” in the US that could spur outflows. The central banker then said it is unlikely for the local currency to strengthen at P49-per-dollar level, citing “high level of economic growth” that could pump up capital expenditures growth and boost imports. “For planning purposes, it is best to think that the current rates are more or less the ‘new normal.’” says Monetary Board member Felipe Medalla.